meLVin is thought to be the last remaining Puck-Nosed Pladottle, a fun-loving species that was common in the Lehigh Valley long ago. After being rescued from the Dime Bank Building Vault on the site of the PPL Center, meLVin journeyed across the valley to find his heart, courage, and brain. 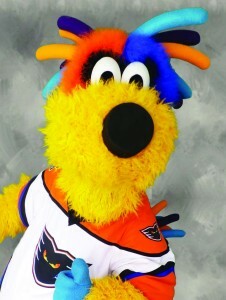 The Lehigh Valley Phantoms decided to give him a home as their mascot. Popcorn is meLVin’s favorite treat. He loves to chow down while watching Phantoms hockey games. Don’t offer this guy chocolate bars, he can’t stand the taste, plus penguins are by far his least-favorite flightless bird.